Take a frying pan and add oil ,in hot oil add mustard seeds once it crackles add channa dal,urad dal and bits of cashew once it turns light golden colour add rava and fry on medium heat for 3minutes,for this add chopped curry leaves ,green chillies and ginger mix well and turn off the gas.Once it’s cools down completely, add salt,soda and 3/4 cup curds( use only sour curds as it enhances taste) and keep it for 5 minutes.Then again add remaining curds and add chopped coriander leaves. And keep it for 5 more minutes ,meanwhile take idly moulds, grease oil and sprinkle some grated carrot on it.By this time rava idli batter will be ready (Batter should not be too thin or too thick). Now with a ladle fill the idly moulds and cook in steam for 8- 10minutes. 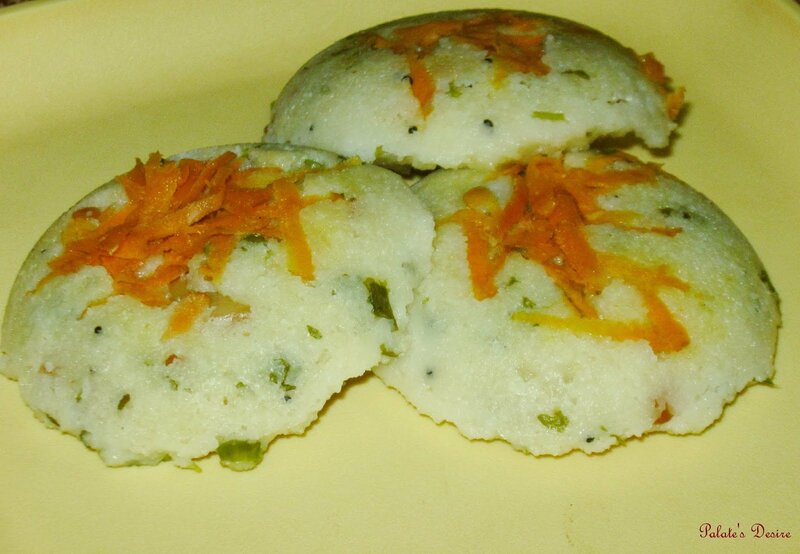 And give the standing time minimum of 5 minutes.Never over cook idlis as it will turn hard. (I always cook only for 8 minutes and give standing time of 5-7 minutes).Once the molds are cool enough to hold,put some cold water beneath the molds so that you can remove perfect iddlies from molds. Serve hot with Coconut Chutney and Mix Vegetable saagu.